Lt. Brad Snyder, blinded by an IED explosion in Afghanistan, is now training for the London 2012 Paralympics. Lt. Brad Snyder slices through the watery warmth with powerful movements and methodical rhythm. Each arm stroke is tallied, each breath measured as he glides forward in a sharp, precise line. He knows that a coach is watching, that a big clock is ticking, that a concrete wall is looming. He sees none of it. But away from the hard edges and surprise bumps of his dark, new world, Snyder senses, finally, he is gaining some serious ground. Blinded last September by a dirt-cloaked bomb in an Afghan ditch, Snyder, 28, slowly is creating a fresh vision for a life once blazed at high speeds and even higher tension. The former bomb defuser is, for now, interning at a Baltimore software company, staying at a corporate apartment and navigating with a cane. He also is logging 4,000 yards per day at a local pool and — this week — dreaming of London. Brad Snyder laughs with co-workers of RedOwl Analytics during their lunch break. Snyder, blinded last September by an IED blast in Afghanistan, is competing for a spot on Team USA for the 2012 Paralympic Games in London. On Thursday, Snyder competes at the U.S. Paralympic Swimming Trials in Bismarck, N.D., aiming to capture one of the 14 spots allotted for American male swimmers. A quick time in the 400 meter freestyle — about 4 minutes, 48 seconds, he and his coach estimate — will earn him a ticket to Great Britain this summer for the Paralympics, an international sports festival for disabled athletes held after the closing of the London Summer Games, using the Olympic venues. Based on his practice times, Snyder believes he has strong shot at hitting — or nearing — his 4:48 goal on Thursday. Snyder is quick to emphasize, as well, that he is in no way a lock to make the American team. Unlike the U.S. Olympic swimming trials, where roster slots are handed to swimmers who win their designated distances at that critical meet, Paralympic spots are determined by how a swimmer’s personal best ranks against the top international times recorded since Jan. 1, 2011 at that distance — and within each disability category. That’s literally a world of pressure: the Navy officer versus the best blind swimmers on the planet. Lt. Brad Snyder lost his sight in an IED explosion in Afghanistan last September. 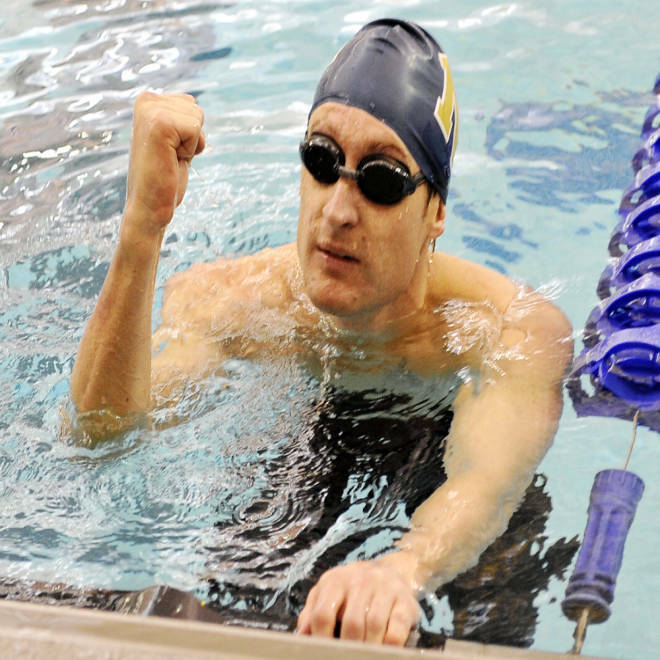 The Navy officer is now training to represent the U.S. at the London 2012 Paralympics. One byproduct of the wars in Afghanistan and Iraq is a deeper talent field among American Paralympic hopefuls. Consequently, the competition to make Team USA is tighter in 2012 compared to prior years. About 220 athletes will comprise the 2012 U.S. Paralympic team roster bound for London. About 15 percent of them (roughly 33 men and women) will be military veterans and active-duty soldiers — most of those in track and field, said Beth Bourgeois, associate communications director for U.S. Paralympics. At the 2008 Summer Paralympics in Beijing, Team USA sent 16 athletes with military backgrounds, spanning wheelchair rugby, wheelchair tennis, track, rowing, archery, sitting volleyball, and cycling. Just one was a swimmer. It’s quite natural, actually, for Snyder to dive into the water to find himself. Back in his hometown of St. Petersburg, Fla., his father first coaxed him into a pool at a young age, back when Snyder’s smarts left him bored with schoolwork, often too chatty in class, and perhaps a bit directionless. “Brad was a little bit of a trouble maker when he was a kid and our dad was just looking for something for Brad to put some energy into, instead of just wandering on his own,” recalled Mitchell Snyder, the Navy officer’s 25-year-old brother. At first, the rigid discipline of swimming intrigued Brad Snyder. Soon, the sport consumed him. In high school, he helped his team capture conference and district championships, finishing second in the state of Florida during the 2000 and 2001 seasons. But his dad, Michael, had other lessons waiting for the oldest of his four children. The father routinely preached motions such as “leave something better than you found it” and “everything is about service to something bigger than yourself.” Snyder remembers how his father once spied a stray hamburger wrapper drifting through a McDonald’s parking lot. He instructed his son to pick it up simply because it was the proper thing to do. Those bits of parental wisdom ultimately inspired Snyder to seek to serve his country. He applied for an appointment to the Naval Academy. The coaches there were equally interested in the talented prep swimmer. Snyder was accepted in the fall of 2001 and by late 2002 he was swimming for Navy. His initial pool style in college matched his high-octane personality: Storm off the blocks as hard and fast as possible and dare the other swimmers to try to keep up. He didn’t know how to pace himself — in the water or when it came time to choose a Navy career following his 2006 graduation. For active duty, he opted to become an explosive ordinance disposal officer, or EOD. Defusing bombs appealed to his problem-solving nature, and the job allowed him, occasionally, to swim. In Iraq and Afghanistan, where the anti-American weapon of choice often was and is an improvised explosive device, EODs were in high demand. Snyder was deployed to Iraq in October 2008, staying until March 2009. He was redeployed to Afghanistan in April last year. “The [EODs] are really the front line,” Mitchell Snyder said. “They might trip wires. Or, when trying to defuse a bomb, it might blow up in their face. Knowing that he was the first man to go and check things out really frightened me. His uniform had some extra level of protection but there was nothing on his face but sunglasses. The bomb that took his vision, however, was not one Brad Snyder ever saw. While rushing to help two Afghan soldiers wounded in an initial IED blast last Sept. 7, Snyder stepped on a second, hidden device in an irrigation ditch spanning a farm field. “My right eye was effectively popped, like a flower almost, and there were pieces of fragmentation that had gone into my left eye,” Snyder said. His face was burned and lacerated from chin to hairline. The rest of his body, however was untouched. He had one final moment of vision before the world permanently went pitch black. In that second, he looked down and saw that his arms and legs were still attached. A little more than a week later, at Bethesda Naval Hospital near Washington, D.C., doctors told Snyder they could do nothing to salvage his sight, not even restore a faint sense of light. His damaged eyes were surgically removed and replaced with prosthetics. “I knew the risks I was assuming. I knew I was very fortunate to be in that hospital bed and not in a coffin in the ground. And I knew I could not control the past,” Snyder said. By late October, Snyder needed a refuge of sorts from the walls he repeatedly smacked with his body and face while learning to walk with a cane. He stepped back into a pool and swam, pounding out a few hundred meters. The water and the strokes felt so natural, so normal, he ached to race. He playfully challenged non-competitive swimmers — yet opponents who nonetheless could see. He beat them. Next, Snyder wanted to take on other blind swimmers. The Paralympics, he knew, could offer him that chance. In Baltimore, he began training with a coach. He began kicking again. COMING FRIDAY: How do you swim — and challenge world records — when you can’t see the lane dividers, your competitors or the finish line?